Fictionaire is simple – players make up a bogus definition or fake answer for a word or question asked by the game’s host – trying to trick him or her into believing that their answer is correct. To earn points in Fictionaire, players either have to choose the right definition – or get someone to pick their answer. Even better, if a player bluffs someone into choosing the wrong answer, they earn a bonus point. Fictionaire is a fun mix of creative storytelling, trivia knowledge and bluffing skills. 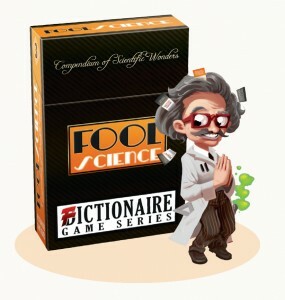 The Fictionaire Game Series includes 4 differently themed card packs – Classic Fictionaire, Tall Tales, Fool Science and Naturals – each with 120 questions. It’s designed for 4 to 7 players and there are both English and French language versions. To learn more visit the Fictionaire webpage. You can pickup Fictionaire at your local game store, or order it from the Days of Wonder webstore. This entry was posted on Wednesday, August 25th, 2010 at 09:00 and is filed under Fictionaire, Miscellaneous, News. You can follow any responses to this entry through the RSS 2.0 feed. Both comments and pings are currently closed.